Last July, four of us hunkered over a large oak table in the back of the Martinez Museum. We squinted at each other as sunlight gently pierced through the venetian blinds; if we had worn fedoras and gun belts we would have taken them off. Suddenly, our small talk ended "Well, ok then, where do we start?" Like the notorious gumshoes of yesteryear, we divided up our unsolved mystery into small investigative pieces. Only our whodunnit wasn't a crime -- far from it! -- the mystery that we wanted to solve that day was to uncover the key players and the key places of the Martinez Equal Suffrage League of 1911, the organization that helped women win the vote throughout Contra Costa County and the rest of California. Of course we didn't find the answers to all of our questions in one day, but within a few months we were ready to share our sincere and earnest detective work with the public. By September, enthusiastic about all that we had unearthed, my colleagues and I built an astounding exhibit at the Contra Costa County Historical Society's History Center and then we eagerly planned a Women's Suffrage lecture series that is currently taking place at the Veteran's Memorial Hall on Thursday evenings. The exhibit, like the lecture series, is meant to teach, to raise questions and to inspire thoughts about the lives we live today and if you leave with more questions than when you came in, we have done our job. Researching local women's history certainly has its frustrations. We wanted to know who these women were, but the only answer we kept getting was that they were their husband's wives. The President of the Martinez Equal Suffrage League was Mrs. W.S. Tinning. Her husband, a prominent attorney at the time was (surprise!) Mr. W.S. Tinning. Mrs. H.M. Bush, whose husband -- guess who?-- a local realtor, consistently attended the "suffrage teas." Mrs. Simon Blum, wife of -- you guessed it -- Mr. Simon Blum, was, like the women listed above, consistently active in our local suffrage movement, but she also took on a strong leadership role by hosting and organizing suffrage events. In order to figure out this identity crisis we went directly to biographical files that we have at the History Center and the Martinez Museum. Here we were able to find that these women had family histories and names of their own long before they married. It appears from our research that the majority of women who participated in Contra Costa County's Women Suffrage movement were from the upper middle class and were generally wealthy. These women saw themselves, particularly during the Progressive period, as role models and leaders. There was much to be improved and these women felt they could do it. It is because of their wealth and their status that their fingerprints are left on our past; their names litter the society pages, the property assessment books, the probate records and it is their names that eventually fill the obituaries. Leontine Blum (nee Alexandre) lived in a mansion where the Martinez Library is today and she had servants in her house, two of which, say the newspaper, were Chinese. Like most Progressive women leaders she participated in the Ladies Educational Society, the Martinez Free Library and even though she practiced Judaism as a child, she volunteered in Christian Churches here in Martinez. We have two photos of Leontine and the information collected about her says she was very industrious and won numerous awards at the county fair. She had five children, three of which were girls. Leontine, a veritable suffrage leader, was 69 during the 1911 campaign. Louise Bush (nee Frazer) was 43 in 1911. She married at the youthful age of 19 and had five children. Her family, unlike Leontine's, was a "pioneer family" and much has been made of her mother and her father arriving in Martinez via wagon train and purchasing 600 acres of land which eventually became the property of Shell Oil. And because Louise married into another notable family, who also incidentally purchased an equally large tract of land, the paper trail of her life is doubly plentiful. Louise and both of her parents, Delilah and William, are prominently buried in the Alhambra Cemetery. As we investigated further and further into the identity of our suffrage leaders, their identities became more complex, more satisfying and very similar to our own. Look behind any strong women today and you will find a role model. Louise's husband's grandmother -- Abagail Bush -- was in upstate New York and presided over one of the first women's rights conventions of 1848 before moving to California. Abagail was a young mother at the time, but fifty years later, while living in Martinez, she still felt the tug of women's rights. In fact, in her biographical file it says proudly that she was a "pioneer in women's rights." In 1898 she wrote a letter to Susan B. Anthony that said; "I think the time draws near when women will be acknowledged as equal with men." Both Louise and Leontine knew Abagail long before she died. Louise married Abagail's grandson eight years before Abagail passed and Leontine -- according to the biographical papers from the Martinez Museum -- went to Abagail's 69th birthday party! Having fleshed out some of the leaders, the other angle that we wanted to solve in our investigations was the exact location of various suffrage events. The 1911 Martinez Gazette was very handy for researching and gathering up this data. This was my beat and I spent a couple of long hot summer days in the Contra Costa County Library. I gathered up names, like those mentioned above, and made note of suffrage venues. The largest, most dramatic venue was the play that suffragists put on called "How the Vote Was Won." This one night play drew a crowd of over 200 visitors to the Bay View Pavillion. Fortunately, one of my partners in crime had done some research in 2009 for the Martinez Historical Society and she was familiar with its unmarked location up on Green and Talbert Streets. We even had a photograph, but sadly the Pavillion burned down in 1912 and the land was subdivided. Two suffragist venues tried to give us "the slip" but we remained stalwart detectives. Fireman's Hall, which we were not able to immediately find, kept coming up again and again; "a woman's suffrage club will be organized at Fireman's Hall in this city" or "it was decided to give a suffrage tea in Fireman's Hall" and finally the State President of the Equal Suffrage League addressed a large gathering at, you guessed it, Fireman's Hall. " They talk as if it would take us every hour of every one of the 365 days of the year to do our voting, while we can do it in the time we are devoting to bridge and society, and be better for it." Mrs. Elizabeth Lowe Watson was right on the mark as both Leontine and Louise were regular hostesses of the Original Whist club and Thursday Afternoon Bridge Whist Club. The State President of the Equal Suffrage League was speaking to the choir; we just had to find the location. Searching for the location of the Fireman's Hall sent us scurrying for maps of the city. Certainly, a Fireman's Hall would be labeled on a map? Perhaps the location was known so well, like the Bay View Pavillion, that placing it on a map was superfluous. We looked at a Sanborn map; these are used for insurance purposes and are every historian's dream because buildings and environs are labeled scrupulously. No luck. We felt a bit under pressure as we were in the beginning stages of putting together our exhibit and clearly Fireman's Hall was a centerpiece of Suffragist agitation. And we didn't know where it was. Pressures such as these can drive people to drink and that's exactly what happened. One of my colleagues, who shall remain nameless, went out for drinks and began divulging our failure to uncover the whereabouts of Fireman's Hall to a well-connected friend who said, "Oh, I know where that is, it's where Nu-Way Cleaners is now." The next morning she rushed down to Las Juntas Street, saw it sitting there plain as day and called all of us and told us the great news. The idea of finding our final mystery location of suffragist activity -- "The Headquarters" -- latched itself unrelentingly into my soul: "Tomorrow afternoon the League will hold an important meeting at its headquarters in the Bragdon Building." On the face of it, this seemed simple enough, "let's find the Bragdon Building." This drove us back to biographical information and, of course we found quite a bit of information on Mr. Bragdon. Mr. Edmund Bragdon was a prominent county doctor, originally from Maine, who settled in Martinez. Here's the sweet part: he was a widower and his second marriage was to a local woman named Jane Gray Frazer. (Another document spelled her name Fraser.) When I read this, I thought: "Wasn't Mrs. H.M. Bush a Frazer?" I looked back at Louise's obituary; there was no list of the names of siblings, only that there were nine. I went back online to the Alhambra Cemetery site that heralds Louise's "pioneer parents" as Delilah and William. The list of several siblings did not include Jane. At this point, I sent out feelers to Avice Taylor, a veteran volunteer at the History Center to find anything on the name Bragdon. Our first smoking gun was Edmund's obituary which lists Jane G. Frazer as his wife. The second smoking gun was the 1868 probate record of Jane's father which lists the names of all of his nine children and his wife Delilah. "Jane, aged 17" is written very legibly. She was second eldest but the name "Louise" is not listed. Instead, an illegible name of a three month old baby, who most probably is Louise, was written as Sonierana. Louise and Jane were sisters seventeen years apart; in 1911 Jane was 60 years old and Louise was 43. Jane must have helped her mother, Delilah, raise the remaining toddlers as Delilah never remarried. I imagine her as a work horse; 20 years caring for her siblings and helping out in any way that she could. Jane married Edmund Bragdon -- another caregiver like herself-- late in life, even today, at the age of 42 and within three years her husband died leaving her with her ten month old son, Roland. For awhile we thought the Bragdon Building may have been one of the two properties that Mr. Bragdon left Jane in his will. 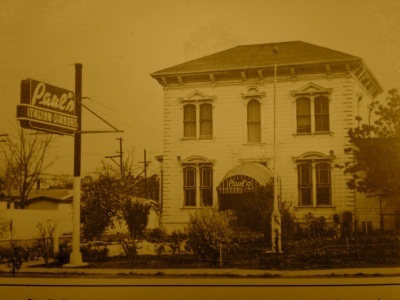 Their home, (for old timers -- Paul's Restaurant) which no longer exists, was also Mr. Bradgon's medical office. Further research at the county records office revealed that, for whatever reason, Jane Gray Bragdon inherited an amazing amount of property from other people. And it was one of these properties, inherited specifically from Mr. Roland Bunker at his death in 1898 (two years after her husband died) that became "The Bragdon Building" or, as we like to say now, "The Headquarters For the Women's Equal Suffrage League." Paul's Restaurant - The Headquarters? The mystery gets sweeter! Come find out where the Bragdon Buiding is located. Ms. Jacobson will be giving a lecture at the Veteran's Memorial Hall on this very topic Thursday night, October 27th at 7 p.m.